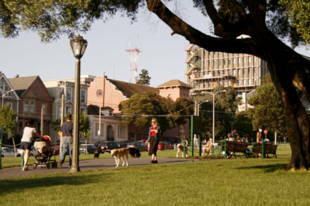 Duboce Park features baby swings, play structures for kids and a sand play area. There is also a basketball court. 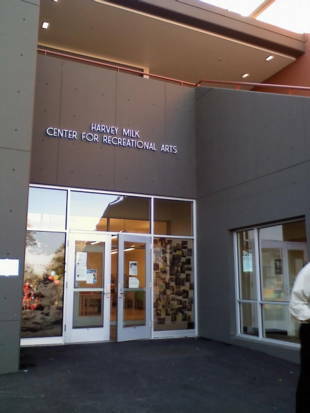 The restrooms are located at the adjacent Harvey Milk Rec Center. The large grass field is a mecca for local dogs. 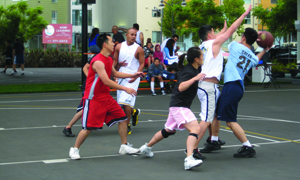 The park is located right next to the Harvey Milk Recreational Center, which offers a wealth of community programs which are free are very inexpensive. Normal Recreation Center hours are: M, T, W, F: 9:30 a.m.-6:30 p.m.; Th: 9 a.m.-9 p.m.; Sat: 9 a.m.-5 p.m.; closed Sundays. The current hours of operation at the Photography Center are: Thursday, Wednesday, Thursday, 1 p.m.-10 p.m.; Friday, 1 p.m.-6 p.m.; Saturday, 10 a.m.-4 p.m.; Sunday, Monday, closed. For more information about the Rec Center or the programming, please contact Center Director Brando Rogers at brando.rogers@sfgov.org or at 415-554-8742. 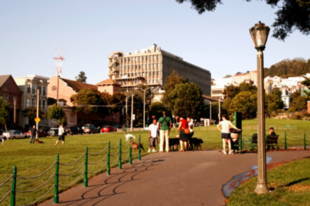 Duboce Park is maintained by the San Francisco Recreation and Parks Department. Bus: Muni Metro N Judah to Duboce Park. You can also take J-Church or 22-Fillmore to Church and Duboce Streets and walk two blocks west on Duboce. The site was meant for a hospital. The Van Ness Ordinance designated it a 'public reservation,' and an engineers map in 1861 labeled it 'hospital site.' In the 1880s and ' 90s, it was leased to the San Francisco Female Hospital for an edifice that was never built. Colonel Victor D. Duboce, who served with the First California Volunteers in the Spanish-America War, was elected to the Board of Supervisors on his return. Shortly thereafter he died, on August 15, 1900 and was buried in the National Cemetery at the Presidio. In passing a resolution extolling his 'high character, loyalty, and amiable disposition,' the Supervisors changed the name of Ridley Street to Duboce Street and turned the old hospital reservation into Duboce Park. Source: The Duboce Triangle of San Francisco by Alexander S. Bodi, 1983. 'Duboce Park Is Now For The City' declared the San Francisco Call, reporting the dedication on September 9, 1900. Amid the boom of a cannon and cheers of the crowd, the president of the Duboce Park Improvement Club introduced Mayor James Phelan who complemented the club for its work in securing the old hospital lot and spoke with feeling of the late Colonel Duboce, saying that the park was 'a fitting tribute to the hero's memory.' The Mayor promised to expedite the $5,000 appropriation requested by the Improvement Club, and in 1901, Duboce Park was under construction with a budget of $4798.56. In 1906, the park became 'Tent City' for earthquake refugees, and thereafter it stayed out of the news until the July, 1969 Examiner story headlined 'Duboce Group Raps Inaction on Park.' The Fair Play Association for Duboce Park, headed by Mrs. Betty King and joined by then-Assemblyman Willie Brown Jr., accused city officials of giving low priority to their issues: a full-time playground director, new playground equipment, a safety fence between the park and Muni's Sunset Tunnel, and greater community access to the Recreational Art Building at 50 Scott Street. Thirteen months later the Recreation and Park Commission voted to erect a safety fence. On May 26, 1979, the Recreational Arts Building was renamed the Harvey Milk Recreational Center in honor of the slain supervisor. One year later, after controversies about its placement were resolved, Johanna Poething's famous Harvey Milk Mural, faced Duboce Street when it was unveiled and dedicated. 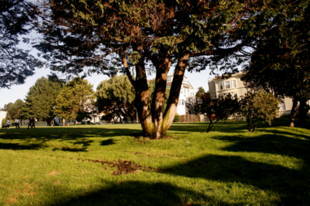 Today, the Friends of Duboce Park are working with the Recreation and Park Department to renovate the grounds in the play area. The Friends have raised over $35,000 to purchase new equipment which, in addition to traditional swings and slides will include a unique variety of climbing structures. They are also asking that a Cushman motor cart be assigned to the park for hauling soil, trash, and plants. A new irrigation system, funded by a $50,000 Action Grant from the Mayor's Renaissance Crusade, is nearly completed and a centennial celebration of the park and its new playground is scheduled for next spring. Duboce Ave. and Scott St.